Full-length IgG antibodies that specifically bind to a target molecule with high affinity have been extensively developed as research tools, as well as for diagnostic and therapeutic purposes. However, these antibodies are designed primarily to target proteins expressed on the cell-surface or on some secreted proteins. This is because antibodies usually cannot cross intact cellular or subcellular membranes in living cells due to their large size and hydrophilicity. At Orum, we developed cell-penetrating antibodies, which can access the cytosol of living cells following receptor-mediated endocytosis. 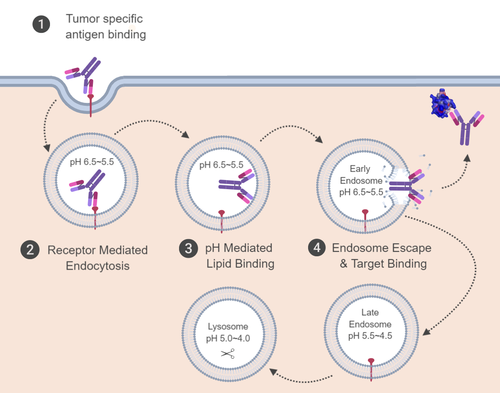 This unique capability will enable next-generation therapeutic antibodies that directly target cytosolic proteins, which are associated with many untreatable or difficult-to-treat human diseases such as cancer or rare diseases. In principle, we can engineer various therapeutic antibodies with the ability to enter the cytosol. Our fully human antibodies do not require chemical conjugation or formulation for delivery. Therefore, the manufacturing procedures we would use are similar to those used for any therapeutic monoclonal antibody. Our antibodies can be engineered to specifically bind different cell-surface receptors to enhance targeting to specific tissues. A general strategy for generating intact, full-length IgG antibodies that penetrate into the cytosol of living cells. mAbs, 2014 Nov 2, 6(6):1402-1414. Endosomal acidic pH-induced conformational changes of a cytosol-penetrating antibody mediate endosomal escape. Journal of Controlled Release, 2016 Aug 10, 235:165-175. Quantitative assessment of cellular uptake and cytosolic access of antibody in living cells by an enhanced split GFP complementation assay. Biochem Biophys Res Commun, 2015 Nov 27, 467(4):771-777. Engineering of a tumor cell–specific, cytosol-penetrating antibody with high endosomal escape efficacy. Biochem Biophys Res Commun, 2018 Sept 18; 503(4):2510-2516. Antibody targeting intracellular oncogenic Ras mutants exerts anti-tumor effects after systemic administration. Nature Communications, 2017 May. 8:15090. KRAS targeting antibody synergizes anti-cancer activity of gemcitabine against pancreatic cancer. Cancer Letters, 2018 Dec, 438:174-186. "Medical gallery of Blausen Medical 2014". WikiJournal of Medicine 1 (2).DOI:10.15347/wjm/2014.010. ISSN 2002-4436.